Today we have a story about a girl called Annie, which I shared at the Child Care History Network Conference earlier this year. Hers is a sad story, but at the same time it can teach us a lot about the complexities of diagnosis in the early-20th Century. Annie was born in 1894 in a small village near Dorking in Surrey. It wasn’t an easy childhood for her: when Annie was 10 years old her father died of pneumonia, and to make matters worse, one year later her mother died of congenital heart disease. We don’t know what happened to Annie immediately after she was orphaned, but about a year later she went into the workhouse in Dorking. Her two older brothers were working as farm labourers in a nearby village, and her older sister was married and living on another nearby farm, but none of them could afford to help Annie. This meant that the workhouse was the only option. Annie remained in the workhouse in Dorking for a year until 1907, when she was 13. 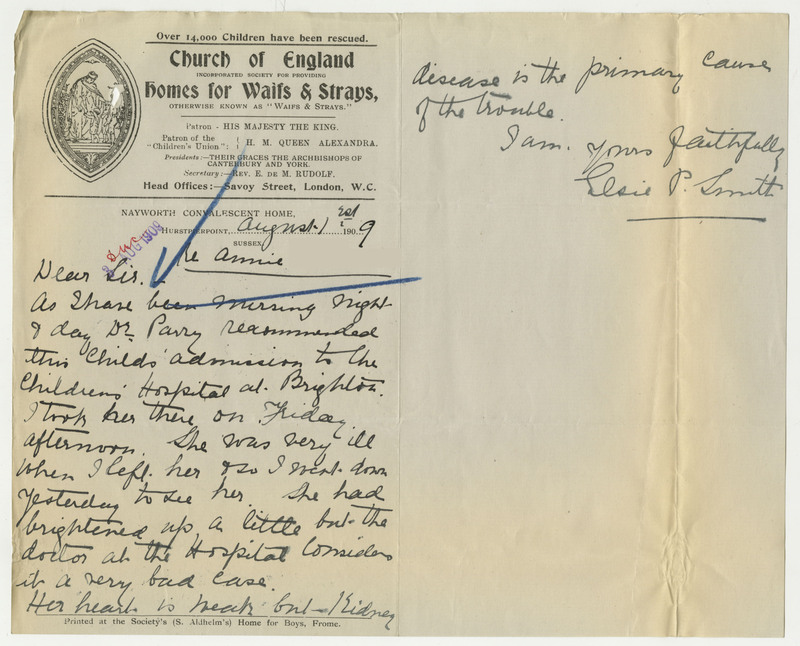 At this point, the Dorking Guardians of the Poor filled in an application for Annie to enter the care of The Children’s Society (then known as the Waifs and Strays Society). Why the application was made at this point, we don’t know; but it’s understandable that they thought it would be good to get Annie out of the workhouse. 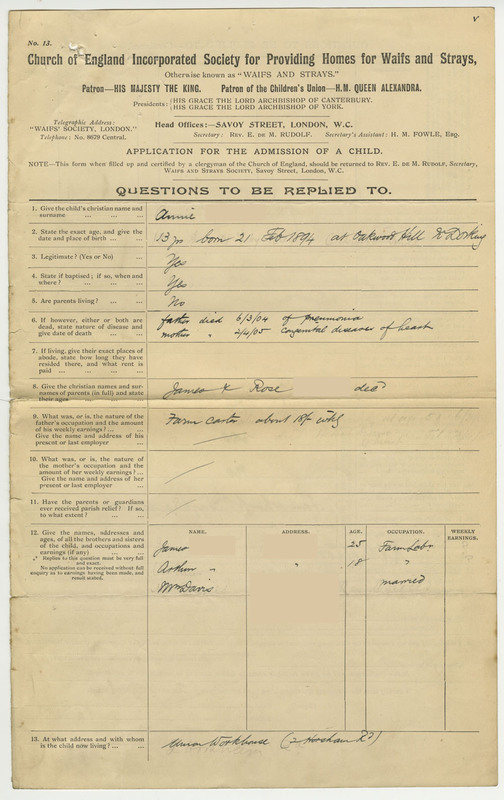 See the first page of Annie’s application form below (click the image to see a larger version). 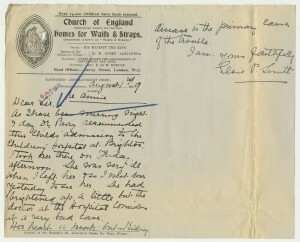 Annie’s application was successful and in June 1907 she entered St Margaret’s Home in Penkridge, Staffordshire. 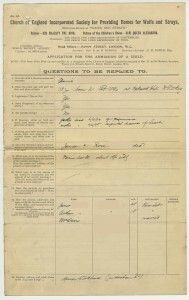 Just before entering the home, a medical form notes that Annie is in good health. Unfortunately, when Annie had been in St Margaret’s Home for two years, her health began to falter. She was sent to Stafford Infirmary, where the doctor who saw her diagnosed her with a weak heart. At this point Annie was 15 (the school leaving age at the time was 12), an age at which the girls in St Margaret’s Home often left care to start work. The doctor at the infirmary advised that Annie shouldn’t start work for at least a few months and that even then it should only be light work. With this advice, Annie was sent back to St Margaret’s Home to recuperate. Time passed and yet Annie didn’t seem to be getting better. The local doctor at St Margaret’s Home saw her and diagnosed her as having pneumonia along with the heart disease. The doctor’s prognosis, however, was good: he said that with medicine, care and sea air, Annie might get better in a month. If you’re a regular reader of this blog, you will have noticed that sea air is a treatment that was very popular in the late-19th and early-20th Centuries. The doctor at the home said that Annie should be sent to the East Coast of England because its sea air was known to be bracing. Presumably, when it comes to pneumonia, bracing sea air was thought to be best. Following the doctor’s orders, The Waifs and Strays Society tried to find Annie a place in their home in Lowestoft in Suffolk. This home, however, didn’t have any special facilities for sick children and so couldn’t take Annie on. With the East Coast not feasible, Annie was instead sent to the South Coast. On this coast, at Hurstpierpoint in Sussex, The Waifs and Strays Society had a dedicated convalescent home, Nayworth Convalescent Home, where Annie could get specialist medical treatment. We next hear of Annie in July 1909, when she had been at Nayworth Convalescent Home for a month. Her illness had grown worse, leaving her bedridden and eating nothing but milk and barley water. By this point, all talk of Annie going out to work had ended. It was thought that she might never be well enough to start work, and might have to rely, once more, on the workhouse in Dorking. it a very bad case. Annie stayed in hospital for a month, with her condition sometimes getting better and sometimes growing worse. The matron from Nayworth Convalescent Home kept in frequent contact with the hospital during this time. Sadly, in late August 1909, Annie lost the battle she had been fighting and passed away, aged 15. Her death certificate states that she had died of pancreatitis followed by heart failure. Correspondence in Annie’s file describes just how much she would be missed by the people who had looked after her during her time in care. She was said to have been very patient in the face of her illness and grateful for all that was done for her. When it comes to Annie’s story, I’m particularly intrigued by the variety of diagnoses that she was given. Her first diagnoses were heart disease and pneumonia and, if you remember, these are the diseases that Annie’s parents had died of. You have to wonder if the doctors were thinking that Annie’s illness might be hereditary or linked to her parents in some way. Then, when Annie went to hospital in Brighton, she was given a diagnosis of kidney disease, suggesting that the doctors there saw she was having abdominal trouble. Finally, on the death certificate, it states that Annie died of pancreatitis and heart failure. We will never know which diseases Annie actually suffered from. It seems likely that she had either kidney disease or pancreatitis, and that she also had a hereditary heart condition. She may even have had pneumonia as well, although it’s hard to tell from this distance of time. This lack of clarity shows us just how difficult it was for doctors to reach a diagnosis, and how difficult it was to treat cases like Annie’s, with only the medical knowledge available at the time.